Heaters that convert electrical energy to heat energy are called electrical heaters. Electrical heaters are used for cooking, heating water and space heating. Electric heaters are also used in various industrial processes. An Electrical resistor is the heating element present in every electric heater. The electrical resistor works on the principle of Joule heating. The modern electric heaters use nichrome wire. 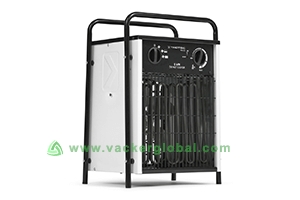 Vacker KSA supplies Electric Heaters in Dammam, Riyadh, Al Khobar, Jeddah, etc. Space heating heaters are used to warm rooms and interiors. Various methods are used for space heating. Vacker KSA's space heaters are used in places where air-handling is complicated. These are also used as room heaters. The places that are cool and unheated air flows use radiant heaters. Basements and garages generally use radiant heaters as spot heating. Task-specific heating can be done by the radiant heater. These heaters operate silently and are risky too. The heating element (nichrome) heats the air in the surrounding by thermal conduction. These heaters are filled with oil. Convection heaters are used in heating closed places and in comparison to radiant heaters they are of low risks. The other name for fan heaters is forced convection heater. It is a heater which includes an electric fan for the airflow. The risk that they come up with is the explosion when they come up in contact with furniture. An electrically driven compressor is used to operate a heat pump. A refrigeration cycle extracts the heat energy from the air present outside and moves the heat to the space that is to be warmed. Vacker KSA's Heat pumps sometimes can gain low-grade heat from the air that is present outside. Ground source heat pumps are very efficient and reliable in places that have average winter temperatures. The air source heat pumps cannot absorb good quality air and convert it to heat, as the air outside can be very cold. A tube is used to cover the electric resistance heating material that can be directly placed in water is called as immersion heaters. A temperature sensor is used to control and verify the desired temperature of the water. Only big immersion heaters have a thermostat or a temperature sensor. Small immersion heaters generally don’t come with a thermostat as they are used for a short period of time. These heaters are comparatively cheaper than the domestic immersion heaters as they are used for domestic purpose. Domestic immersion heaters are generally of 3 kilowatts. Theses heaters are used to heat up water and any other liquid for household use. Vacker KSA's Industrial immersion heaters are of two types. They are screwed or flanged. Screwed industrial immersion heaters are generally of 24 kilowatts whereas, flanged heaters range up to 2000 kilowatt and are used in industrial work which require high use of these heaters. The system and its efficiency depend on the limitations of the system. For example; if the requirement of the customer is electrical space heating than he gets the satisfying result as all energy is converted to heat energy. But the noise made by the converter can be bit annoying. This conversion, however, is not healthy for power plants as its efficiency becomes very low while in the need of electricity. In order to be more electrically efficient, a heat pump that operates by the use of electricity can be used. It can be used by raking power from the ground, exhaust air and outside air. But the convenient forms of energy are wind, nuclear energy, hydroelectric energy etc. as the resources are not directly in contact with heating appliances. There are limits and many disadvantages as well as many advantages too. Accurate use of temperature and distribution of heat energy can be done by industrial electric heating. These can be built in any size and can be placed anywhere and can be portable too. They have a high rate of response. They lend it to rapid-cycling mass-production equipment and have no side effect of the heat on the surroundings. The use of electrical energy results in the rise of cost. If you use fuel directly, the capital cost is comparatively cheap. This is although not efficient using less energy to achieve a small result. Resistance heating, induction heating, and much more are the methods of electric heating. As the long period of heating is costly, the half day use can be cost efficient too. If customers use electrical heaters wisely they can reduce the cost too. They just need to use these heaters on a half-day basis. This method can make the use of electrical heaters more cost-efficient.